COMPATIBLE MODELS: This garmin vivosmart hr band is NOT suitable for the watch if the beginning of the series number isS / N 4JE / 4JF / 4VD / 4VB. It fits for Garmin Vivosmart HR only ( NOT for Garmin Vivosmart HR + ). AVAILABLE LENGTH: Garmin vivosmart hr bands fit wrist length 5.11"-7.67"(130mm-195mm),the size can be adjusted according to the circumstance of individual wrist. PREMIUM MATERIA: High-class silicone material makes the garmin watch band Lightweight and Water-proof; Compression molding process, sturdy and durable, the softness is moderate, wear very comfortable. 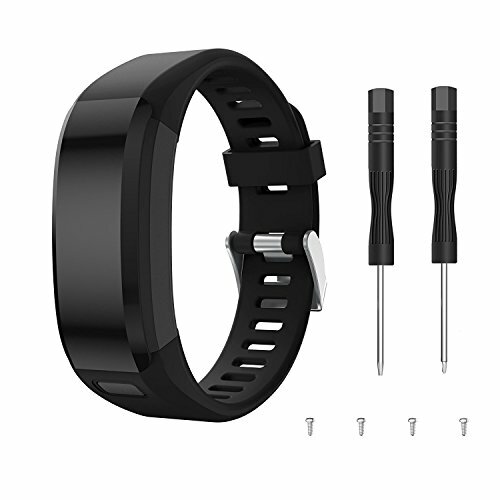 PACKAGING INCLUDED: 1-Pack Soft Silicone Band for Garmin Vivosmart HR (No Tracker, Replacement Bands Only) + 2*Screwdriver + 4* Screw nuts. LIFETIME WARRANTY: Unconditionally refund or resend garmin vivosmart hr band with any quality problems, life-time friendly customer service. Soft silicone with smooth finish for a sporty look.Garmin Vivosmart HR bands Comfortable and durable. Band comes with Garmin Vivosmart HR Lugs on both ends, which locks onto Garmin Vivosmart HR Band Interface precisely and securely. YaSpark stands behind the quality of everything we sell, we would definitely address our customer queries and find alternatives to make sure that your issues stands resolved. Q:Does the Garmin Vivosmart HR Band suitable for all Garmin version? A: Yes,It is one size,and it can adjust according to personal wrist. Q: If I find the item Vivosmart HR bands defective, how could I get an exchange? A: You can contact Amazon customer service or email us, we will help you solve it.